This is a very affordable product that can be purchased from Ulta for $5.99. I have the shade in 020 Champagne and this is a natural highlight that is suitable for all skin tones. (there is now a new shade that's more pink!) The packaging is the typical drug store plastic however it's sturdy enough to protect the product from breaking when it's dropped. The powder is soft and velvety and can be bu...read moreild up for a stronger highlighting effect. 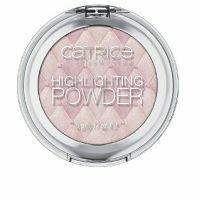 It's not the most refined powder but for the price this is great for those looking for a drug store powder highlight.